Jeff Herman opened his literary agency in the mid-1980s while in his midtwenties. Since then, he has made nearly one thousand book deals, including many bestsellers. 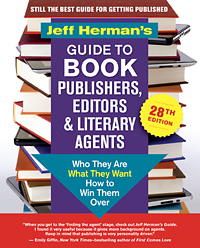 In the newest, 28th edition of his highly respected resource, Jeff Herman’s Guide to Book Publishers, Editors & Literary Agents, he unmasks nonsense, clears confusion, and unlocks secret doorways to success for new and veteran writers. It truly is the writer’s best friend. In celebration of National Novel Writing Month (NaNoWriMo), in which participants aim to write an entire novel during the month of November, Jeff Herman reveals how you can really start and finish a whole novel in just thirty days. We hope you’ll enjoy this charming and empowering article. Because I ignored my own internal deadlines, I’m compelled to write this piece at the last minute, and able to empathize somewhat with your immense challenge in undertaking NaNoWriMo. Though it feels counterintuitive, my advice is to not just write something but stand there. Imagine yourself at the peak of a mountain on a gorgeous day, looking down upon breezy fields, meandering brooks, and luscious meadows; perhaps there are sleepy hamlets or noisy settlements. It’s in your power to freeze and move time and to change the weather and landscape. This universe forms the tapestry for the story you will tell. Every detail will bend to your command. It’s upon you to manifest the past, the present, and especially the future. The absolute power to create or destroy reality is exclusively your domain. Your thoughts will forge everything there is, and no power in the universe would ever dare to invade or distort your special homeland. Do you want there to be people? If so, you alone will conjure them. And you will infuse them with all the distinct characteristics, personal choices, and experiences that define humanity. Perhaps some of them will be made in your image and reflect back parts of you that linger in unknown closets or poke at your heart and guts like shooting stars whenever you are not guarding the gates of your soul. This isn’t something you will do for anyone else; it’s only for yourself and, ultimately, in behalf of the eternal homeland that shares your life in a way that nothing else, that no one else, ever can. Only you can bring joy and pain. Love and hate. Good and evil. This is your dimension, and it will be as valid and real as anything else that exists inside or outside your veil of knowledge. God had only six days to create everything that is. As a mere mortal, you are given thirty days to do much the same. Except you have the luxury of building upon the foundations that your Creator has already provided. Or you can go rogue and beyond established templates. You are free to create what you will with your mind and hands, because you yourself were created that way. For the next thirty days, you will follow in the footsteps of whatever brought you into being. This continuum is the font of your power, but only if you choose to know it and use it. In a way, there’s never a Delete key. You may remove the words from the paper and from the memory of your tools. But everything you’ve ever thought never dissipates. It may cease to be part of the seeable math of your life but will always remain part of your footprint. You were created to create, and that’s your most urgent call. There’s nothing unimportant about it or you. You wouldn’t be at the threshold of this moment if it weren’t already decided that you can and will. You can choose to look away, to walk away, but you will be called back again and again until you have fulfilled the need that brings you. Creation and failure cannot fill the same space at the same time. Unfortunate consequences and events are simply the ripples of deeds and thoughts, to be followed by subsequent ripples that might bring redemption and healing. No story is truly over until its creator says so, even if there are no more pages to be read. Failure doesn’t measure anything that matters to the soul of a writer. There are receptors for despair and sadness. But you are the sole master of what’s real for you. You must never vacate that ground no matter how hard you are pushed, because it’s your land and it belongs to you as a legacy from whatever made you. Failure is an illusion designed by those who choose to negate both the past and the future, for themselves and you. Don’t go to their land or eat their bitter fruits. Failure opposes life. Failure isn’t the result of anything; it’s the beginning of nothingness that takes all that it can grasp in order to exist. Failure can’t know you if you refuse to know it. You were not made in the image of failure. Each day of these thirty days will be the best day of your life so far. Your devotion and perseverance will be your first reward. The expansion of your stamina and tenacity will be the second reward. There will be no limit to the rewards you will come to know during this time of your life. Jeff Herman’s literary agency has ushered nearly one thousand books into publication. Herman is the author of the acclaimed Jeff Herman’s Guide to Book Publishers, Editors & Literary Agents and is often featured as an expert in print and broadcast media. He lives in Stockbridge, MA. Find out more about his work at www.JeffHerman.com. Inspired by the book Jeff Herman’s Guide to Book Publishers, Editors & Literary Agents, 28th Edition. Copyright © 2018 by Jeff Herman.